by Tom Cooper and David Nicolle, with Lon Nordeen and Patricia Salti. Advantages: Execllent black and white and full colour photos; dozens of inspiring profiles; high quality text. Disadvantages: Coverage proves weakest when the authors succumb to political projection. 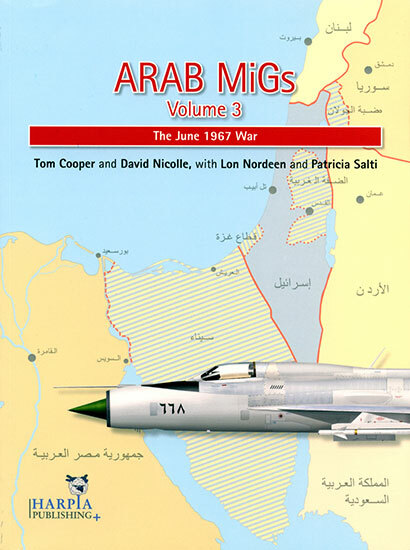 Recommendation: For the best account of Arab air actions during 1967’s fateful fighting, snag Arab MiGs Volume 3. Christmas arrived early this year with the third installment of HARPIA’s brilliant Arab MiGs series. While prior parts spanned years, this one details days – Arab air arms in 1967’s brief, bloody “Six Day War”. As before, coverage starts where the previous book ends. “Addenda/Errata” adjust, amend, explain and expand the first two volumes. That’s where respected associates Lon Nordeen and Patricia Salti – the latter a Royal Jordanian Air Force historian – offer corrective comments. Coverage then courses chronologically – and geographically – through the decisive conflict. Initial chapters detail Heyl HaAvir attacks on Egypt. Of special note are Israel’s exceptional intelligence efforts – key to its surgical success. Text next turns to illuminating accounts of actions over Jordan and Iraq. Coverage finally hits crescendo with Israel’s assault on Syria. Instructive statistical analyses season this superb study. And post scripta recap the war’s repercussions – and Arab rebuilding efforts to 1969. Nearly 180 rare B&W and color photos, Air Orders of Battle, maps, selective bibliography, appendices and index enhance this carefully crafted, admirably annotated effort. Modelers and markings enthusiasts will particularly prize coauthor Cooper’s outstanding color profiles. I now know how to cloak my MiG-21F-13 – and it involves car paints! Nor do titular “MiGs” dominate details: Cooper and Nicolle again augment their account with colorful Arab Hunters, Sukhois, Beagles, Badgers and more. Coverage, though, proves weakest when the authors succumb to political projection. Did Egyptian pilots really die for the “freedom” of their dreadful dictatorship? And while first-hand “narratives” often excite and entertain, they can also prove unreliable and inaccurate. Just ask AVG historians. Neither point diminishes this terrific tome. Cooper and Nicolle capably deconstruct myths of Israel’s flawless triumph over incorrigibly inept Arabs. And they valiantly mine notoriously secretive Arab sources for elusive nuggets of balanced truth. Ramifications of the “Six Day War” continue dominating Middle-East politics and policies. And for the best account of Arab air actions during 1967’s fateful fighting, snag Arab MiGs Volume 3. Better yet, get all three titles. Nothing equals the value, scope or authority of this vital venture. HARPIA’s superb series enjoys my strongest recommendation! With thanks to HARPIA PUBLISHING for the review sample.